PEACE NOW ~~~ OR ~~~ PEACE NO! In addition to the five year UN weapons embargo, missile sanctions will stay in place for eight years. 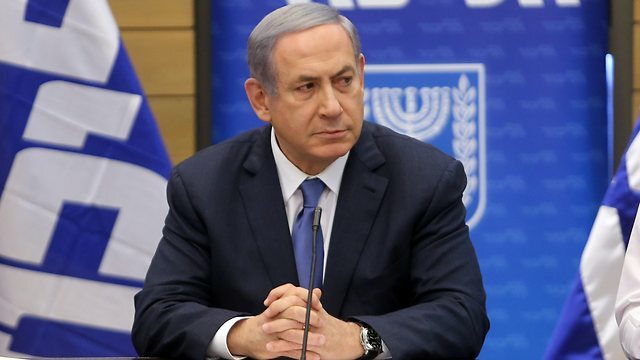 Agreement to maintain missile embargo for eight years; Israeli politicians predict nuclear Iran; PM: Mistake of historic proportions. Iran’s support for international terrorist groups remained undiminished last year and even expanded in some respects, the Obama administration said Friday, less than two weeks before the deadline for completing a nuclear deal that could provide Tehran with billions of dollars in relief from economic sanctions. Yet even as the Islamic State group and the Taliban were blamed for most of the death and destruction in 2014, the department’s annual terrorism report underscored the ongoing threat posed by Iran and its proxies across the Islamic world and beyond. Tehran increased its assistance to Shiite militias fighting in Iraq and continued its long-standing military, intelligence and financial aid to Lebanon’s Hezbollah, Syrian President Bashar Assad’s embattled government and Palestinian groups Hamas and Islamic Jihad. While the study said Iran has lived up to interim nuclear deals with world powers thus far, it gave no prediction about how an Iran flush with cash from a final agreement would behave. World powers and Iran are trying to conclude an accord by the end of the month, setting 15 years of restrictions on Iran’s nuclear program in exchange for significant relief from the international sanctions that have crippled the Iranian economy. The negotiations don’t involve Iran’s support for militant groups beyond its border. But Israel and the Sunni monarchies of the Persian Gulf, Iran’s regional rivals, fear a fresh wave of terrorism as a result of any pact. President Barack Obama, hoping to ease their fears, has said most of the money would go to Iran’s economic development. In total last year, nearly 33,000 people were killed in almost 13,500 terrorist attacks around the world, according to the State Department report. That’s up from just over 18,000 deaths in nearly 10,000 attacks in 2013. There were 20 attacks that killed more than 100 people each in 2014, compared to just two a year earlier, the report said. Among those were December’s attack by the Pakistani Taliban on a school in Peshawar that killed at least 150 people and the June attack by Islamic State militants on a prison in Mosul, Iraq, in which 670 Shiite prisoners died. Despite all indications pointing toward increased violence, the State Department’s counterterrorism coordinator said the numbers didn’t reflect improvements by the US and its partners in stamping out terrorism financing, improving information sharing, impeding foreign fighters and forming a coalition to fight the Islamic State group. “We have made progress,” Ambassador Tina Kaidanow said. The rise in kidnappings is mainly attributable to the mass abductions by terrorist groups in Syria, notably Islamic State militants and the al-Qaeda-linked Nusra Front. Friday’s report noted the “unprecedented seizure” of territory in Iraq and Syria by the Islamic State group, its ability to recruit foreign fighters to join its cause and the emergence of self-proclaimed affiliates, notably in Libya, Egypt and Nigeria. It cited a rise in so-called lone wolf attacks in the West and terrorists employing more extreme methods of violence to repress and frighten communities under their control. So Iran is a terrorist for helping Iraqi Shia Militia (formed under American occupation to fight Sunni terrorists who were attacking American forces) to protect their homes in Iraq from ISIL forces. America and allies are helping the “Free Syrian Army” a predominantly Shia volunteer militia from many countries including NATO members, to attack the homes of Syrian citizens (and incidentally to attack ISIL and to summarily behead any ISIL members that are caught, in retaliation for ISIL beheading of Syrian forces), and that is not “terrorism” but supporting democracy by killing those that vote for a free syria. Al Nusra, an Al Qaeda affiliate, is supported by USA and Israel to fight Assad, and ISIL, but not to fight the FSA or Israel, sometimes fighting the Syrian Kurds, who are fighting to protect their homes from ISIL, Al Nusra and Turkey but the Kurds are also supported by Israel and USA, as well as Assad and maybe Russia. I am glad that the misunderstanding is cleared up. The very first sentence is a outright lie and sets the tone for the entire article “Iran’s support for international terrorist groups remained undiminished last year” Specifically what “terrorist” groups do Iran support? Or is in fact Iran’s support for groups which are resisting invasion of their various country’s by invading armies from or controlled by Israel and the US. Israel and the US have both publicly admitted to be directly and indirectly supporting both ISIS and Al Qaeda, both of whom are universally recognized as terrorist groups. This author clearly doesn’t want the reader to have any time to consider who the real terrorists are in the Middle East. The author mentions “95 acts” last year. Funny enough not a word about the massive ongoing military occupation and/or operations against Afghanistan, Iraq, Libyia, Iran, Syria, etc., et., by the US/Israel. Actions in which MILLIONS of Muslims and Christians have already been killed. And 10’s of Millions more are now refugee’s because their homes, villages and cities have been literally turned into rubble by “allied” forces. Again, who are the real terrorists? the alleged “95” attacks which killed and/or injured a few dozen people? I think not. Consider that last year alone Israel murdered nearly 2000 people many of whom were women and children by bombing them to death as they remained trapped behind prison walls in Gaza. As for the “seizure” of land is this author kidding or just plain crazy? Just what in the hell does he think the US and Israel have been doing fo rthe last 15 years in Afghanistan, Iraq, Palestine, Syria etc? if not seizing the land? The hypocrisy, lies and deceit by Israel and the US clearly are limitless at this point. Economic sanctions are not real – sorry. Business & trade must go on. You cannot grow tons of weat & corn for export – billions of dollars worth. And the US says “no & throw it away” & this will actually happens. Or global corporate has billion dollar deals in play with Iran & the US/UN say “no” & GLOBAL CORPORATIONS will actually obey. Who would then compensate everyone all the way down to the farmer & factory owner who produced the goods ? It would cast the earth & everything would shut down. The growers are massive they can’t just grow for a select few, it dosen’t work that way. Transportation costs a fortune – put these people out of business & NOTHING MOVES ANYWHERE. – the whole planet will stop. They are telling us lies – including Iran.